Everybody loves no-bake desserts as they are easy and quick to prepare, perfect for those moments whenever you want something sweet but don’t feel like turning on the oven. 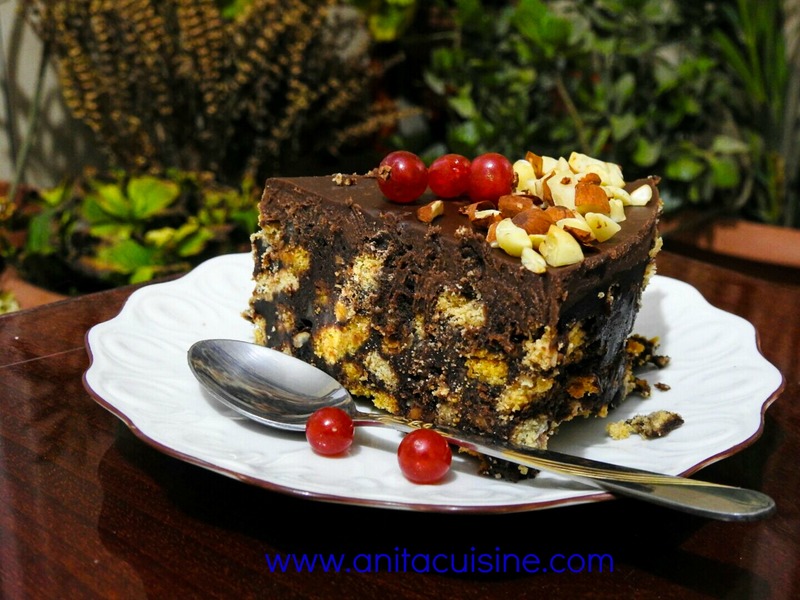 This Chocolate Biscuit Cake is one of them, and I guess many of us are familiar with it since childhood, in various shapes and forms. I had to prepare something quick for a get together with my friends and this was the perfect recipe. Chocolaty, rich dessert made with crushed biscuits, chocolate syrup and toasted nuts. This recipe takes a little time to make and tastes awesome and everybody love it . The recipe is really easy to prepare, there is no way you can wrong with it. I’ve used my mother’s recipe she had for years and just added chocolate ganache on top. You can always make variations to this chocolate biscuit recipe, add different flavors like orange zest, rum, almond extract, dried fruits. Break the biscuits into small pieces into a large bowl. Heat a non-stick pan over medium high heat and toast walnuts or hazelnuts for about 5 minutes, stirring frequently to toast evenly. Add toasted nuts over the biscuits. Prepare the chocolate syrup. In a medium sauce pan add sugar and cocoa powder. Stir to combine and gradually add water, while stirring to combine well. Add the butter and place over medium heat. Bring to boil for about 7-8 minutes stirring constantly. Remove from heat and add vanilla extract. Set aside to cool slightly for about 10-15 minutes. Pour the syrup over the biscuits and nuts and combine well using a large spatula or spoon. Transfer the mixture into a 23 cm round cake form, bottom lined with parchment paper. Press well using the back of the spoon or an offset spatula. Cover and refrigerate for about 30 minutes to 1 hr before preparing the chocolate ganache. Prepare Chocolate Ganache. Place cream into a small saucepan and heat until just begins to boil. Pour hot cream over the chopped chocolate and let sit for 1 minute. Stir until smooth. 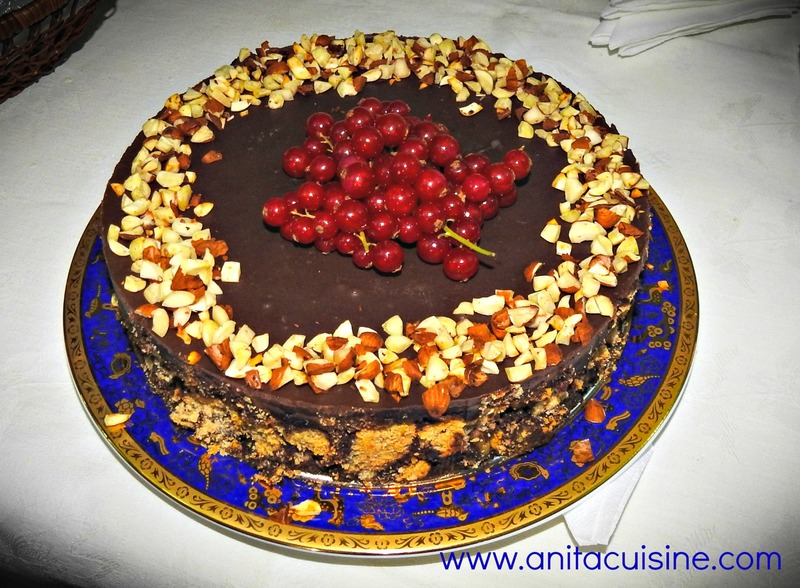 Pour ganache over the chocolate biscuit cake and refrigerate to set for about 3-4 hours or overnight before serving. Decorate with toasted nuts if desired, cut into slices and serve. thank you for the re-blog Moégrrl !